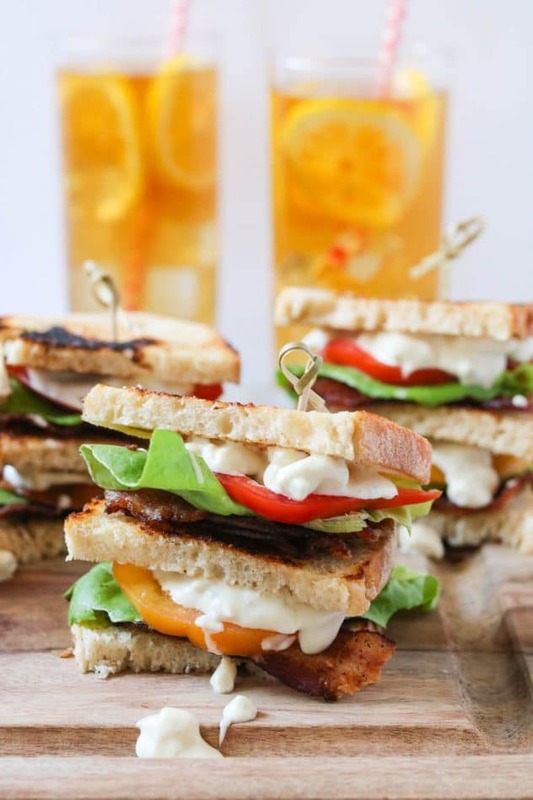 Take your traditional BLT sandwich to next level delicious with this BLT club sandwich and a savory blue cheese mayo! 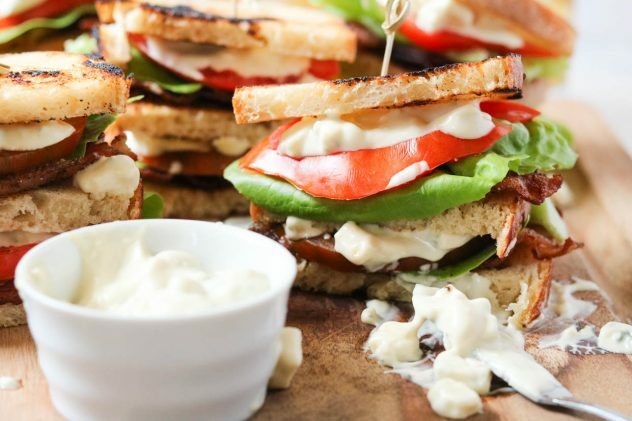 This ultimate BLT club sandwich with blue cheese mayo will have even the most skeptical eaters digging in! 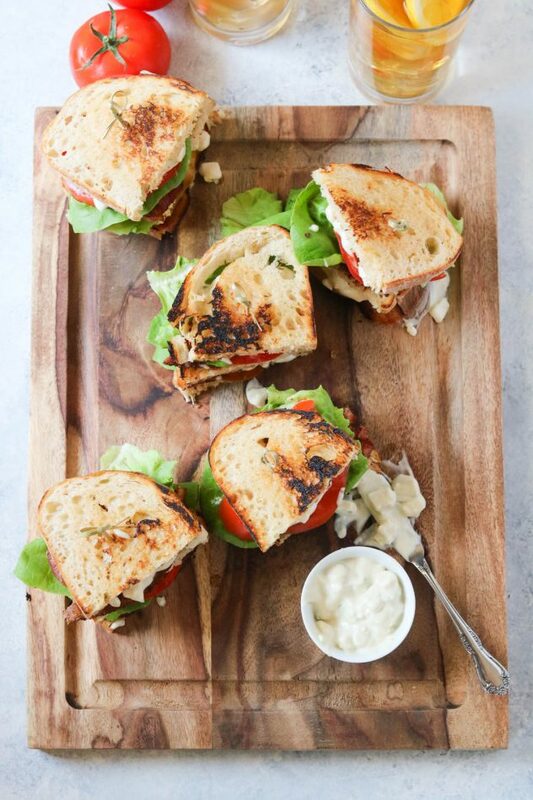 I’ll admit, growing up I was never really fond of BLT sandwiches. BLT’s were always a summer-time staple, with fresh tomatoes out of the garden, but for me, I ended up eating a BCM sandwich (bacon + cheese + mustard). I disliked tomatoes something awful growing up. As I’ve grown older, my taste buds have wised up and I’ve learned to embrace the harmony of flavors from fresh ingredients. 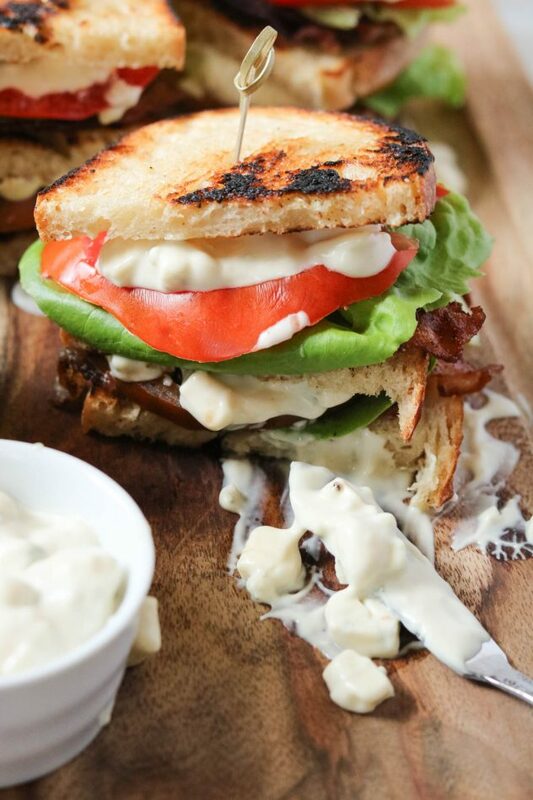 Fresh heirloom tomatoes, soft butter lettuce, peppered bacon, toasted sourdough bread, and a savory chunky blue cheese mayo, I mean can the flavors get any better than this? I just love taking traditional recipes and elevating them to a mouth-watering, irresistible new version! Maybe it’s all the Food Network shows I watch weekly, or maybe it’s just my love for all things food and flavor. Even my oldest son (who’s now a young adult himself) loved the blue cheese mayo and he’s not a blue cheese fan, so if you’re skeptical give it a try. 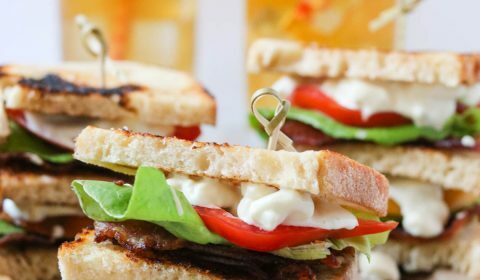 To bring the BLT club sandwiches altogether, you’re going to toast the sourdough bread with a little garlic butter in a hot skillet, giving it a nice crisp buttery texture. Of course, if you need a gluten-free option, there are gluten-free sourdough breads available, like this New Grains Gluten Free Sourdough San Francisco Style Bread, 32 oz Loaf . From there it’s just a matter of assembling your sandwiches. 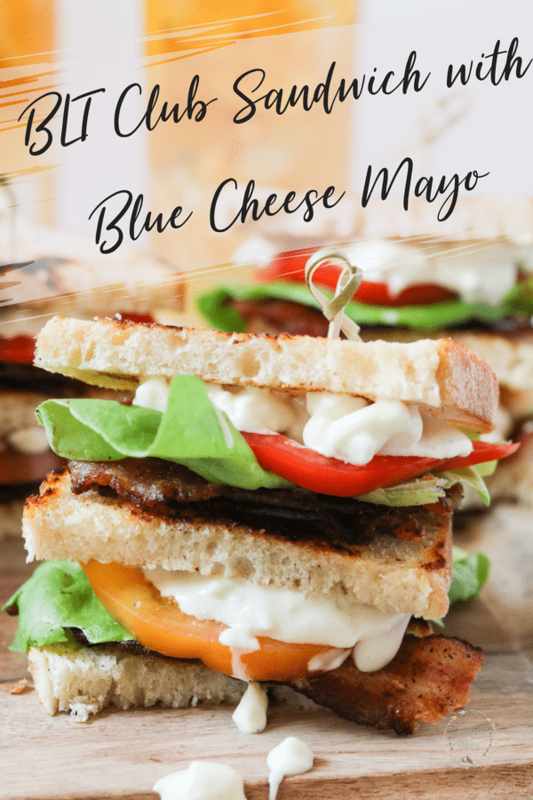 A bottom layer of toasted bread, topped with bacon, then lettuce, add the tomato, repeat those four ingredients again, slather on the blue cheese mayo, and top it all off with another piece of toasted bread. These would be the perfect summertime meal or even serve them as a heavy appetizer at your backyard patio party. In a small bowl, combine the dijon mustard, mayo, blue cheese crumbles, lemon juice, and a pinch of salt. Stir to combine, place into the refrigerator until ready to assemble the sandwiches. In a large skillet, begin cooking the bacon. Season the bacon with black pepper. Once cooked, remove from skillet and place onto a paper towel-lined plate. Continue until the entire package is cooked. While the bacon is cooking, slice the tomatoes, set aside. Peel away individual leaves of the butter lettuce, set aside. Melt the butter, add the garlic powder and stir to combine. Butter one side of each slice of sourdough bread. Place the slices buttered-side down into a large skillet and toast over medium-high heat. Continue this process until all slices of the sourdough loaf are buttered and toasted. Cut each slice in half. Begin assembling your sandwiches. Place one piece of the toasted sourdough bread buttered side down. Add one slice of bacon, breaking in half if needed. Add one slice of tomato, then one leaf of lettuce. Add another piece of toasted sourdough bread. Then add another slice of bacon, then another slice of tomato, followed by another leaf of lettuce. Add a layer of the blue cheese mayo, then top with another piece of toasted sourdough bread, buttered side up. Secure with a sandwich toothpick. Continue to assemble until all pieces of bread have been used, then serve immediately.